Eddie and Shirley remain in close contact with Team Three Chimneys every day. As the company's founders and full-time directors, they play an active role in running their business. 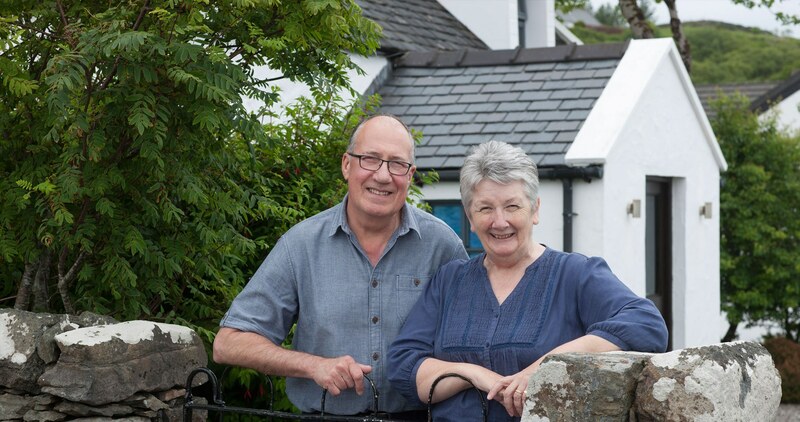 Now older and a lot wiser than when they first moved to Skye with their young children Steven and Lindsay, their business is now very different from how it all began in 1984 as a seasonal, stand alone restaurant. Over the past three years Eddie and Shirley have been wholly responsible for over-seeing the complete refurbishments of The Restaurant interior in 2014/15 and the Bedrooms, Lounge and Breakfast Room in The House Over-By in 2013/14. This cycle has just been completed with the installation of a state-of-the-art new kitchen for the opening of the 2017 season. This creates a spectacular new space for their Team Three Chimneys to work in and for their Kitchen Table guests to visit. Building The House Over-By began in November 1998 and was completed in May 1999. The couple’s immense pride in Scottish food, its culture and traditional dishes, were behind the ethos which they brought with them to Skye to fulfil their dream of owning a bistro-style eatery, serving fresh, home-cooked food. They soon began to achieve recognition and awards, their first major one in 1990, as Scottish Restaurant of the Year. That same culinary ethos, plus high standards of customer service created an iconic Scottish destination experience and remains at the core of The Three Chimneys to this day. Shirley's work in the Scottish Food and Drink Industry has been recognised in many ways. For two years she was Chair of the Scottish Food Commission and helped to launch the Good Food Nation. In the Queen's 90th Birthday Honours List, Shirley was awarded an OBE for Services to Food and Drink in Scotland, recognising a lifetime's work in Skye and throughout the country.